In the updated second edition of Don Chance’s well-received Essays in Derivatives, the author once again keeps derivatives simple enough for the beginner, but offers enough in-depth information to satisfy even the most experienced investor. 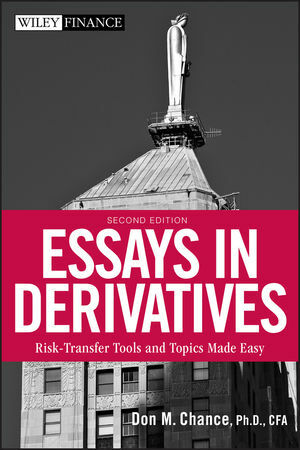 This book provides up-to-date and detailed coverage of various financial products related to derivatives and contains completely new chapters covering subjects that include why derivatives are used, forward and futures pricing, operational risk, and best practices. DON M. CHANCE holds the William H. Wright Jr. Endowed Chair for Financial Services at the E. J. Ourso College of Business Administration at Louisiana State University. He was formerly the First Union Professor of Financial Risk Management at the Pamplin College of Business at Virginia Tech. Prior to his academic career, Chance worked for a large southeastern bank. Professor Chance has had numerous articles published in academic and practitioner journals, is often quoted in the media, and has an extensive consulting practice. He holds a PhD in finance from LSU and is a CFA charterholder.